Judge Russell Bean administers the Firefighter's Oath to Fire Chief Phil Hyman. Chief Hyman's wife Lisa and their two children are by his side. 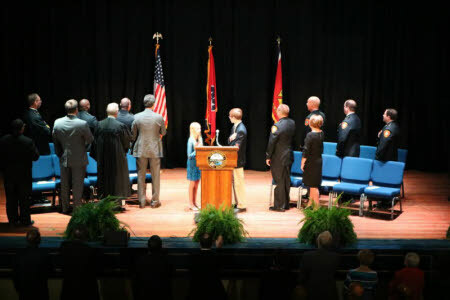 Chief Hyman's two children, Ansley and Mason, lead the pledge of allegiance at the beginning of the ceremony. 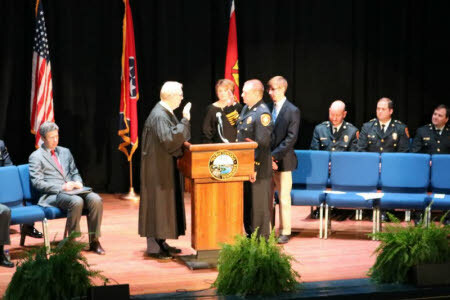 "First of all I would like to thank Mayor Berke and his staff as well as the members of the city council for giving me this incredible opportunity to lead the Chattanooga Fire Department. It is truly humbling to be selected to lead this department and I am honored. I am grateful that my command staff is here to support our department and I am confident in their abilities to move us forward. I also have to mention all the officers, friends, and mentors I've had through the years that have given me the courage and the tools to succeed in this department. "I would also like to thank my loving wife, Lisa, and my two kids, Mason and Ansley, for their continued support. Lisa has been an integral part of my success in this department and has helped guide and support me through many changes and challenges. She has been there for me all along and I consider her the foundation that holds our family together. "My love for the fire service started nearly 22 years ago as a long haired young kid looking for direction and purpose in life. The fire service gave me that purpose and showed me the value of what 'service' to others means. Over the last 22 years I have served in many different capacities with this department and I firmly believe it’s the best job in public safety and one of the best ways to give back to our community. "Serving as the 20th fire chief of this department will present new challenges and opportunities, and I’ll be reaching out to many people inside and outside the department to achieve our overall mission. I feel that any organization has to be adaptable if it is going to succeed. In the fire service we call this 'Situational Awareness'. We have to know what is going on around us to make the best decisions and adapt to ever changing surroundings. "The fire service is a dangerous profession. Our firefighters must put themselves in harm’s way on a regular basis, from going into a burning buildings, to hazardous materials calls, or simply responding to a wreck on the interstate, with distracted drivers buzzing by. "In addition to the obvious dangers I just mentioned, there are the more hidden dangers of cancer. In recent years, we have learned more and more about how all of the carcinogens our firefighters are exposed too are ending their lives prematurely. The numbers are staggering. Cancer caused 70 percent of the line of duty deaths for career firefighters in 2016. "I had an opportunity recently to hear from a local fire chief near Nashville who has survived his struggle with a late stage Multiple Myeloma. He has devoted his efforts in raising awareness for firefighters and community leaders to understand the importance of clean turnouts, exchanging hoods for clean ones at a fire, and taking simple steps to protect from the exposure to carcinogens. "As chief of this department, I believe one of my primary roles is to make sure our firefighters have the tools and equipment they need to do their jobs effectively and safely. "Thanks to my predecessors, and support from Mayor Berke and the city council, we have made great strides in providing that equipment. But the challenges continue. "I am very grateful that Mayor Berke and the city council approved the purchase of a second set of turnout gear for roughly a third of our department during Chief Adams’ administration. That will enable those firefighters to wash their gear between fires, which will reduce their exposure to the carcinogens. I know the mayor and city council will continue their support of our firefighters’ health, by approving the purchase of additional sets of turnout gear in the near future to help protect the rest of our firefighters. 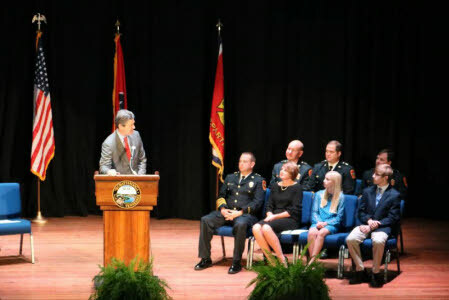 "Just two weeks ago, Mayor Berke and I held a news conference at Station 1 to announce that the Chattanooga Fire Department has earned the highest rating possible, with an ISO Class 1 Public Protection Classification. We have joined the top .5 percent of fire departments across the nation with that top designation. "What does that mean? It means lower insurance premiums, especially for commercial properties in Chattanooga. It also means that our firefighters are pretty good at what they do. "Being a Class 1 fire department doesn’t mean we’re perfect. There’s always room for improvement. And in the coming days, weeks and months ahead, we’re going to identify areas where we can make improvements and keep this department moving forward. 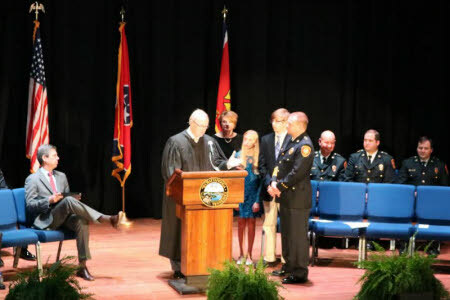 "Lastly, I can’t say enough how proud I am of the men and women that represent the Chattanooga Fire Department and the level of professional service they provide to our community, and I look forward to all the challenges as your new fire chief.